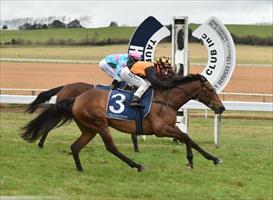 Following an encouraging fifth place performance in the Group 2 Auckland Thoroughbred Breeders Stakes at Counties last start, Ruby Armani (pictured) will face her toughest test to date when she takes her place in the Group 2 Cal Izuzu Stakes over 1600m at Te Rapa on Saturday. To be ridden again by senior jockey Matthew Cameron, Ruby Armani has drawn barrier seven in a 12 strong line up of mares. “It was a gutsy run last time and she deserves her place in this field,” co-trainer Pam Gerard said. The team is also heading to Ellerslie on Sunday with two runners set to line up in their respective 1200m events. Talented filly Starstripe returns to the races following an extended lay off, although her trial at Te Teko last time out suggests she is right on track to producing a bold showing. “She’s done everything right this preparation and we couldn’t be happier with where she is at,” Gerard said. Running in the Rating 65 event over 1200m, Starstripe will be partnered by leading apprentice rider Ryan Elliott. The second runner on the card is the lightly tried Hurry who will be having her third career start to date in the maiden event over 1200m. To be ridden by Craig Grylls, Hurry has also drawn the ace barrier and looks well placed to go one better than her previous start at Avondale over the same trip.